The weekend has brought little by way of clarity, and as such markets look set to trade on the back foot again as investors come to grips with what may be a lengthy period of uncertainty. As noted on Friday, Article 50 is going to be a center of contention for politicians of every stripe; it is perhaps telling that Boris Johnson, noted 'Leave' supporter and putative front run-runner to replace David Cameron, did not mention it once in his Telegraph piece setting out his views on a post-referendum world. (He also promised continued free trade and outward UK travel freedoms while restricting inward freedom of movement; he stopped just short, however, of offering rainbows, pony rides, and lemonade for everyone free of charge.) In any event, the Tory Party leadership (and presumably, the decision on whether to tender Article 50 notification) will not be decided until October. At the same time, legal scholars are pondering whether the devolved parliaments of Scotland and/or other regions could possess an effective veto of withdrawal from the EU via some legal arcana; meanwhile, the Labour Party is crumbling down to its foundations with many MPs deserting the S.S. Corbyn. And to top it all off, it's worth remembering that this referendum was an "advisory" referendum; in other words, there is no legal requirement whatsoever for Parliament or the Government to act upon it in the slightest. As we know, markets hate uncertainty above all else, and we seem set for little but that for a number of months until some of the issues noted above are ironed out. As one Internet wag put it over the weekend, "at least Baldrick had a [bleeding] plan." The news was slightly better for the establishment in Spain, where politics remain an utter muddle but Podemos, the the left-wing protest party, lost considerable ground to the old guard PP and PSOE over the weekend. There's still no prospect of forming a government unless Podemos hops into bed with the old school center-left PSOE and some of the nationalist parties, which they refused to do last December. It's the first election in recent memory where the populist parties did worse than expected (and worse than previously.) Whether this is an aberration in the general populist trend or a sign that Brexit was its apotheosis remains to be seen; to date, betting against the populist tide has not been a wise decision. Meanwhile, spare a thought for the Japanese, caught up in the global tide of risk aversion through no real fault of their own. While Abe has authorized the MOF to take steps to ensure FX stability, it's not clear how much the Japanese can do without triggering a reaction elsewhere. Still, the waterfall price action observed Thursday night was more than a little scary. From Macro Man's perch, USD/JPY has done about as much as could have reasonably been expected to the downside; for choice, he'd look to be an eventual buyer of further weakness. Finally, China has, as expected, ratcheted up the fix dramatically in response to the post-Brexit FX volatility. 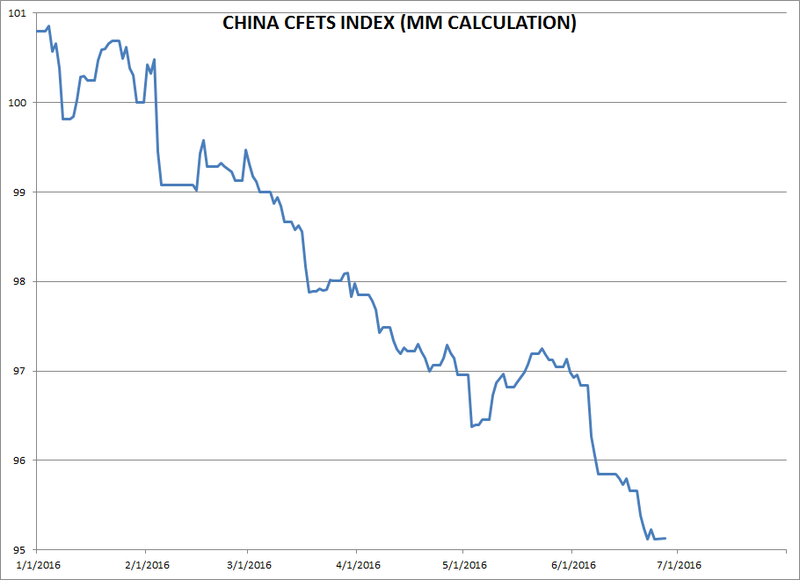 Macro Man noted on Friday via Twitter that the Chinese would need to raise the fix by a whopping 606 pips to maintain a stable CFETs basket (which has steadily declined, of course); in point of fact, they raised it by 599 pips. What do you know....the basket stayed flat, virtually to the basis point, following the game plan identified the other week. Clearly, renewed upside pressure on USD/RMB is not what the global risk complex needs, particularly on top of everything else. Keep a weather eye on the 6.68 region in USD/CNH, where the authorities were offering near the height of the panic early this year. If that goes...watch out. The temperature's gotten quite hot recently, but the torrid times may only just be beginning. No mention of European banks (incl. UK)? They have about 10 days left at current rates of decline. "Our conclusion is that the United States, by metrics of valuation, relative valuation, and comparison with riskless government debt, is fairly priced but no bargain. Japan and Germany, by comparison, are cheap. They offer bargains if investors are willing to test the waters. Companies like Toyota and Bayer or Siemens and Sumitomo are major players in the world. They rank as highly as many companies within the S&P 500 Index do. They are strong, heavily capitalized, globally active enterprises. In one place, they are available for an earnings yield above 7%." Barclays is down another 18% in London, DB making new lows down 13%. That's a good indication that for now the stress in capital markets is not over. Keep an eye on the credit markets for large lumpy movements in high yield..... at some point some of the players in the credit HF universe are going to have to unload some illiquid instruments, but that's just the early phase (the Bear Stearns stage if you like). It's when the really large stressed institutions start to liquidate anything that trades that things will get truly scary. Not sure if that stage happens this time, but we have seen enough examples where selling begets selling. DX is making another strong move this morning and pushing up to the panic level of last Friday. It felt like the pullback to 95 was a new floor for the greenback, and so it appears to be. Commodity weakness (other than gold) seems likely. Good man Leftback, very few on here have a handle on what's going on. I suppose the higher the IQ - the harder it is to say..."I don't Know"
@Leftback - I was wondering whether the bank and builder correction was in part due to Jan Hatzius's of Goldman's call for a mild UK recession by early 2017? Sharp re-assessment of p/e's and prospects. We are still seeing market participants confront the new reality today. US punters are being fed the story that "US markets and economy are unaffected" and so one should buy the dip at these extremely inflated P/E ratios. Certainly there will be a bounce, but we think punters are unlikely to see a new high in SPX this year. The 10 year is at 1.47%, we'll have to wait and see whether it makes new lows below Friday's 1.42%. In the past, MM and others have used a formula for panics of "Buy Spoos/Sell Treasuries at VIX 30". Wonder whether he is looking for that here? We did a bit of that in the winter, and then also bought the second smaller spike/RHS in VIX that followed. Still, what we are seeing here is a bit unusual, and so we are watching the twin canaries carefully (DB and BARC). 12 year old US traders need to be aware that two of the largest banks in the world are going down 10-20% a day, and that this matters, even though it is happening in Yoorp. In light of one's knowledge of their operating model, this does have to be viewed as a very significant threat of global contagion. The record shows that what starts with bank shares in Transylvania all too often ends up with someone waking up in their mom's basement in Pennsylvania to find that their TSLA shares just fell 35% overnight. It's that old story of the inevitable relationship between leverage and forced liquidation. @Skr. Laughing and agreeing with that comment. Holding on to some optionality for now, but basically, yeah, my comment was a long version of "doing nothing b/c I haven't got a Scooby". Expecting a general risk aversion mood to persist for a few days, and a stronger dollar regime to dominate, but that's about it. You'd have to think it would be wise to be a seller of dead cat bounces for now, there must be too many out there eager to jump in and sell at the prior support level of SPX 2040. Right now it looks as though SPX 2020 (the 200 day) is going to be challenged at the open. Cable is great value here, sub 1.32 so I am sticking by my plan to enter long today. 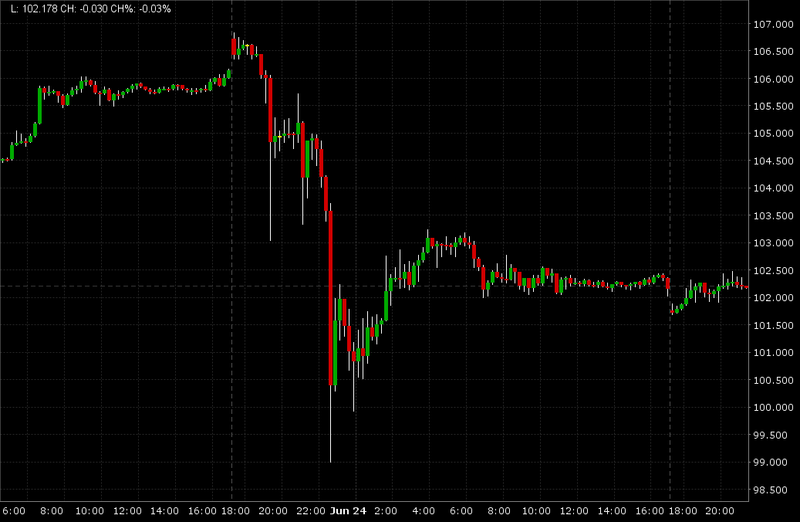 I also nibbled on some gbp.jpy. Cable is plumbing new multi-decade lows but Yen appears to be finding a short term bottom. One has to wonder whether the UK economy really is the worst it has been for the last 30 years. Anyway, maybe cable does go to 1.2 in the next year, but in the short term, I can't help but take the other side of a this very overcrowded short gbp positioning. When there is a reversal, gbp.jpy will be a monster move and cable too. The news is universally bearish and I suspect most of the late to the party corporate dumpers and forced liquidators have dropped their gbp today. And the spec positioning short gbp must be absolutely massive now. 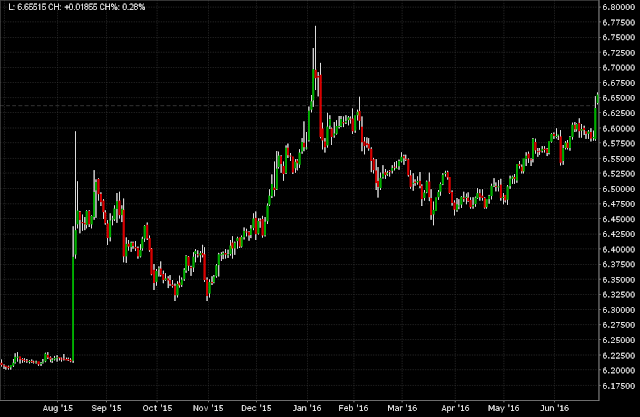 Any thoughts on shorting Gilts here as a medium term trade? Feels like a trade with very little downside at these levels, and potential to get juicy if pounds slump becomes disorderly? Goldman: "Potential demand for high-quality, long-duration bonds could amount to $600 billion in total over the next few years due to both a shift to more fixed-income allocations and a shift within fixed income to more of a long-duration, derisking strategy..."
In 1990, there were 11,500 M&A deals whose combined value was equivalent to 2 percent of world GDP. Fast forward: [Between 2008 and 2014], there have been some 30,000 deals a year totaling roughly 3 percent of world GDP. Global M&A deals jumped 36% per year in value in 2014 and 2015 to reach 6% of world GDP in 2015.
reading some thoughts now circulating that article 50 may never be invoked and an election brought forward and fought (and won) purely on Brexit could claim legitimacy and halt the Brexit process. Also increasing articles claiming brexit vote regrets. likelihood of this ? i am not familiar with UK politics so wonder if there is any substance to this. the flip side is EU want UK out, but then again they cant do anything to force UK to invoke article 50 ? Thank you MM - great analysis as usual. I did not know this was an "advisory referendum" and did not legally bind Parliament to action. This raises a lot of questions, but seems to suggest that the laws of political physics draw this divorce process out even more so than contemplated. And then the question comes to mind, that if the process is drawn out even more and the road map to divorce continues to remain opaque....doesn't the prospect of a "re-referendum" become all the more obvious -- Glastonbury is over now isn't it?? Booger, I suspect we will need a turn-around-tuesday to go with your view. So far I'm watching and waiting. EU banks, well I guess my theory is about to be tested, about how bad can it get. Intesa Sao paulo and other Iti banks just free falling. CoCo's starting to move a bit but still much above Feb lows. Oil/HYG so far contained as are rates and FX but perhaps they are just waiting. Policy response will come but just feels like markets going to have to push a lot harder before it comes. Several people warned against early dip buying, and that seems to have been sound advice. Stay away until the European banks stop free falling seems almost too obvious? At present, I do not see a change in this trend toward populism across Europe or the US. My biggest short-term worry, of course, is Europe. Every SWF that has built up a euro reserve position in the last 16 years must be panicking. They will need to sell European assets, given the risks of further fracturing post Brexit. We have Frexit, Nexit, Auxit, and Itexit to contend with in coming quarters. The Euro will almost surely become a more nebulous concept as the fracture deepens. Further, the risk parity and CTA world came into this whole Brexit trade max long global risk — with low vol fueling bigger and bigger positions. The bottom line is that there are both fast money and real money sellers of risk waiting anxiously in the wings. Of course some folks may still be thinking of buying (or adding to) risk positions on the notion that central banks will come to the rescue as they have always done over the last seven years. And that is likely to be true in the end, but rescue requires a complicated market path with much more pain first. With spoos barely 5% from the all-time highs and the unemployment rate at 4.7%, there is NO sense of urgency at the Fed. I would argue that we need 18 handles in spoos to get the Fed pivoting towards an aggressive easing. Maybe even 17s. Further, while the market may initially react positively to a BoE, BoJ, or ECB move towards more accommodation, those moves will likely backfire as the DXY soars in response. If any of those three move, China will keep fixing USDCNY like they did last night and send us back toward an August- or January-style Chexit trade. The only backstop in town is the FOMC, and they come in at a much lower level. Draghi is about to open his mouth. Anything he can say to help the EU banks? Turnaround tuesday on the cards ? Pol, might be good for a short term DCB punt, but I would JBTFD in the USD for the time being and leave it at that. Crude is going down and it is going to go down all of July and it is going to take a lot of energy stocks with it. See you at SPX 1890??? My Kevlar™ Gloves are staying in the drawer. S&P downgrade of UK, more nastiness ahead for the EU and UK banks, it's ugly. A short-term rally for the next 4 days perhaps: end of the month, end of the quarter, and end of the first half-year. Or, will The Great Brexit-Bear continue to rebalance global portfolios? IMHO, the political vacuum in the UK now with concerns about Scottish secession is the biggest unknown. 1. Is the BoE politically capable of launching QE to save their banks should it become necessary? 2. Will the BoE save RBS this time around should it become necessary? 3. What is the transmission for contagion to European, and American banks? 4. Will concerns about the near future slow down all economic activity in the UK? I see a lot of posts around the web of people in the denial phase - where they've have imagined a scenario where brexit is undone. The most interesting is through a new government that effectively repudiates brexit leaving these past few days as a hazy tequila infused vomit session that everyone eventually regrets and forgets. Whatever the lack of organization and planning for the day after on the brexit side, they did win. So I think we're going to have to live with the uncertainty for a while. Having said that, the market would love nothing else than to pretend that brexit is not happening. I'm personally slowly building a position in SAN and will unload at a euphoric moment of brexit denial that I expect in the new few weeks. We took some profits today in USO, CADUSD and IWM shorts and UUP calls, but we are not interested in getting long equities at the moment - not while the EU banks are falling 10-20% every day. Dip buyers can easily lose one or more appendages in this market environment. At the risk of burning my fingers I worked into some euro bank positions today. In broad strokes my thesis is that the UK banks are totally screwed, but the mainland banks may actually benefit a bit. Much of London banking seemed predicated on the idea that they had unfettered access to EU without full eurozone regulations. No matter what happens going forward it seems unlikely that this special arrangement will continue. Isn't this at least a small tailwind for their mainland counterparts? T - welcome back - where've you been all this time? were you one of the 10 guests on Nico's boat on brexit eve? The answer to your rhetorical question is that it is in fact a headwind to every bank everywhere. left alluded to this a few weeks ago, but failed dip buying is more powerful than any other negative catalyst - I think we may be at a point where we hold our nose, cover our ears, turn off cbbc, and let the price action tell us what the market wants to do - spoiler alert - it may want to do something rather different than our pavlovian 2-3 year experience has taught us. Good luck everyone - the next few weeks, if not months, may be the most interesting we've seen in a while. Some Uk banks lost 25% of their share value today. EU banks down 20-30%. These last 2 working days are the worst days EVER for EU banks. Remember if a bank goes under (and a few of them will), the EU will NOT bail them - there will be bail-ins as was the case in Cyprus. FOLKS IMHO WE ARE GOING TO SEE A BANK RUN IN EUROPE IN COMING DAYS. Don;t panic people, Greenspan just warned that we are about to have another crisis far worse than the GFC, that all welfare spending is unsustainable, and that we face global stagnation and hyperinflation of all fiat currencies. Apparently the only way out is to return to the gold standard. This latest crisis feels like it has legs, and right now I wouldn't buy DB or the Italian banks at any price, but I think we might see Barclays trade at prices very close to the GFC lows, and that might be interesting when we get there, the problem is that's a fair bit lower than where it trades now. We'll keep an eye on Santander and Banco Bilbao as well.